DIE Lunæ, 25 die Aprilis. Message from the H. C. for Expedition to the Propositions about the Adventure for Ireland. And with a Form of a Commission for raising Ten Thousand Men for Ireland. Commission for raising Ten Thousand Voluntiers for Ireland. Message from the King, concerning His Journey to Ireland. Message from the King, about a Printed Paper, intituled, A Question answered, how Laws are to be understood and Obedience yielded. Message to the H. C. with the First of these Messages. Message to the H. C. with the last Message. L. Lieutenant of Ireland's Reasons why he has not repaired there. Ships at St. Malos with Provisions for Ireland. Lords Lieutenants to take out their Commissions. Report about Sir Edward Deering to be made To-morrow. Message to the H. C. with the Commissions of Lords Lieutenants that are Commoners. Message from the H. C. for a Conference about the Yorkshire Petition to the King. Wadsworth and Goldsmith for entering L. St. John's House. Referred to the H. C.
Thelwell, Deputy Lieutenant for Denbigh. Conference, about the Yorkshire Petition presented to the King, reported. The Petitioners sent for as Delinquents. Amendment of the Commission for raising 10,000 Voluntiers for Ireland. Committee to prepare a Commission, for pressing Men to make up the Deficiency in the Number. Committee for the Propositions for the Adventure by Sea for the Service of Ireland. Lord Lieutenant of Ireland's Instructions and Departure to be hastened. Mr. Clarke again recommended to be Minister of Stisteed in Essex. To desire their Lordships to give a speedy Resolution in the Propositions formerly brought from the House of Commons, about Adventurers subscribing for setting forth of Ships for the Service of the Kingdom of Ireland; else the Time of subscribing will be expired. 2. 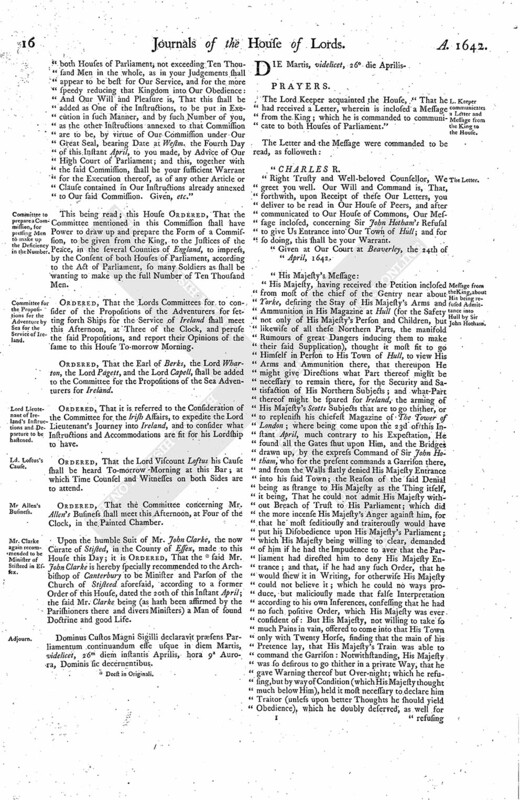 He presented a Form of a Commission to be sent to the King, for the raising of Ten Thousand Voluntiers, for the Service of Ireland; wherein the House of Commons desires their Lordships Concurrence. That their Lordships will return an Answer, by Messengers of their own, in convenient Time. Then the House read the Draught of the Commission for raising Ten Thousand Men, Voluntiers, for the Service of Ireland; and committed the Consideration of the same to the Earl of Leycester, Lord Lieutenant of Ireland, and the Lord Robartes, who are to report the same to the House. The Lord Keeper signified to this House, "That he had received Two Letters, wherein are inclosed Two several Messages from the King, which he is to communicate to both Houses of Parliament." "We are so troubled and astonished to find the unexpected Reception and Misunderstanding of Our Message of the Eighth of April, concerning Our Irish Journey, that, being so much disappointed of the Approbation and Thanks We looked for to that Declaration, We have great Cause to doubt whether it be in Our Power to say or do any Thing which shall not fall within the like Interpretation. But, as We have in that Message called God to witness the Sincerity of the Profession of Our only Ends for the undertaking that Journey, so We must appeal to all Our good Subjects, and the whole World, whether the Reasons alledged against that Journey be of Weight to satisfy Our Understanding, or the Counsel presented to dissuade Us from it be full of that Duty as is like to prevail over Our Affections. "For Our resolving of so great a Business without the Advice of Our Parliament, We must remember you how often, by Our Messages, We made the same Offer, if you should advise Us thereunto: To which you never gave Us the least Answer; but, in your late Declaration, told Us, That ye were not to be satisfied with Words; so that We had Reason to conceive you rather avoided (out of Regard to Our Person) to give Us Counsel to run that Hazard, than that you disapproved the Inclination. And what greater Comfort or Security can the Protestants of Christendom receive, than by seeing a Protestant King venture and engage His Person for the Defence of that Profession and the Suppression of Popery; to which We solemnly protested in that Message never to grant a Toleration upon what Pretence soever, or an Abolition of any of the Laws there in Force against the Professors of it? And when We consider the great Calamities, and unheard-of Cruelties, Our poor Protestant Subjects in that Kingdom have undergone for the Space of near or full Six Months; the Growth and Increase of the Strength of those barbarous Rebels, and the evident Probability of Foreign Supplies (if they were not speedily suppressed); the very slow Succours hitherto sent them from hence; that the Officers of several Regiments, who have long Time been allowed Entertainment from you for that Service, have not raised any Supply or Succour for that Kingdom; that many Troops of Horse have long lain near Chester untransported; that the Lord Lieutenant of Ireland, on whom We relied principally for the Conduct and Managing of Affairs there, is still in this Kingdom, notwithstanding Our Earnestness expressed that he should repair to his Command; and when We consider the many and great Scandals raised upon Ourself by Report of the Rebels, and not sufficiently discountenanced here, notwithstanding so many Professions of Ours; and had seen a Book, lately printed by the Order of the House of Commons, intituled, A Remonstrance of divers remarkable Passages concerning the Church and Kingdom of Ireland, wherein some Examinations are set down, which (how improbable or impossible soever) may make an Impression in the Minds of many of Our weak Subjects; and lastly, when We duly weigh the Dishonour which will perpetually lie upon this Kingdom, if full and speedy Relief be not dispatched thither; We could nor cannot think of a better Way to discharge Our Duty to Almighty God, for the Defence of the true Protestant Profession, or to manifest Our Affection to Our Three Kingdoms for their Preservation, than by engaging Our Person in this Expedition, as many of Our Royal Progenitors have done, even in Foreign Parts, upon Causes of less Importance and Piety, with great Honour to themselves and Advantage to this Kingdom; and therefore We expected at least Thanks for such Our Inclination. "For the Danger to Our Person, We conceive it necessary and worthy of a King to adventure His Life to preserve His Kingdom; neither can it be imagined that We will sit still, and suffer Our Kingdoms to be lost, and Our good Protestant Subjects to be massacred, without exposing Our own Person to the utmost Hazard, for their Relief and Preservation; Our Life, when it was most pleasant, being nothing so precious to Us, as it is, and shall be, to govern and preserve Our People with Honour and Justice. "For any Encouragement to the Rebels because of the Reports they raised, We cannot conceive that the Rebels are capable of a greater Terror than by the Presence of their lawful King in the Head of an Army to chastise them: Besides, it will be an unspeakable Advantage to them, if any Reports of theirs could hinder Us from doing any Thing which were fit for Us to do if such Reports were not raised; this would quickly teach them, in this jealous Age, to prevent by such Reports any other Persons coming against them, whom they had no Mind should be so employed. "We marvel that the Adventurers, whose Advantage was a principal Motive (next the Reason beforementioned) to Us, should so much mistake Our Purpose, whose Interest We conceive must be much improved by the Expedition We hope (by God's Blessing), to use in this Service, this being the most probable Way for the speedy Conquest of the Rebels: Their Lands are sufficiently secured by Act of Parliament. "We think not Ourself kindly used, that the Addition of so few Men to your Levies (for a Guard to Our Person in Ireland) should be thought fit for your Refusal; and much more that (having used so many Cautions in that Message, both in the Smallness of the Number, in Our having raised none until your Answer, in their being to be raised only near their Place of shipping, in their being there to be armed, and that not till they were ready to be shipped, in the Provision by the Oaths that none of them should be Papists; all which appears sufficient to destroy all Grounds of Jealousy of any Force intended by them in Opposition to the Parliament, or Favour to any malignant Party) any Suspicion should notwithstanding be grounded upon it. "Neither can it be understood that, when We recommended the managing of that War to you, that We intended to exclude Ourself, or not to be concerned in your Counsels, that, if We found any Expedient (which in Our Conscience or Understanding We thought necessary for that great Work) We might not put it in Practice. We look upon you as Our Great Council, whose Advice We always have and will (with great Regard and Deliberation) weigh and consider: But We look upon Ourself as neither deprived of Our Understanding, or divested of any Right We had if there were no Parliament sitting. We called you together by Our own Writ and Authority (without which you could not have met), to give Us faithful Counsel about Our great Affairs: But We resigned not up Our own Interest and Freedom; We never subjected Ourself to your absolute Determination; We have always weighed your Counsels as proceeding from a Body entrusted by Us; and, when We have dissented from you, We have returned you the Reasons which have prevailed with Our Conscience and Understanding, with that Candour as a Prince should use towards His Subjects, and that Affection which a Father can express to his Children. What Application hath been used to rectify Our Understanding by Reasons, or Motives have been given to persuade Our Affections, We leave all the World to judge; and then We must tell you, howsoever a major Part may bind you in Matter of Opinion, We hold Ourself (and We are sure the Law and the Constitution of the Kingdom hath always held the same) as free to dissent (till Our Reason be convinced for the general Good) as if you delivered no Opinion. "For Our Journey itself, the Circumstances of your Petition are such, as We know not well what Answer to return, or whether We were best to give any. That Part which pretends to carry Reason with it, doth no Way satisfy Us; the other, which is rather Reprehension and Menace than Advice, cannot stagger Us. Our Answer therefore is, that We shall be very glad to find the Work of Ireland so easy as you seem to think it; which did not so appear by any Thing known to Us when We sent Our Message. And though We will never refuse or be unwilling to venture Our Person, for the Good and Safety of Our People, We are not so weary of Our Life as to hazard it impertinently; and therefore, since you seem to have received Advertisements of some late and great Successes in that Kingdom, We will stay some Time, to see the Event of those, and not pursue this Resolution till We have given you a Second Notice: But, if We find the miserable Condition of Our poor Subjects of that Kingdom be not speedily relieved, We will (with God's Assistance) visit them with Succours, as Our particular Credit and Interest can supply Us with, if you refuse to join with Us. And We doubt not but the Levies We shall make (in which We will observe punctually the former and all other Cautions, as may best prevent all Fears and Jealousies, and to use no Power but what is legal) will be so much to the Satisfaction of Our Subjects, as no Person will dare presume to resist Our Commands; and, if they should, at their Peril. In the mean Time, We hope Our Forwardness so remarkable to that Service shall be notorious to all the World, and that all Scandals laid on Us (fn. 1) in that Business shall be clearly wiped away. "We were so careful that Our Journey into Ireland should not interrupt the Proceedings of Parliament, nor deprive Our Subjects of any Acts of Justice, or further Acts of Grace, for the real Benefit of Our People, that We made a free Offer of leaving such Power behind, as should not only be necessary for the Peace and Safety of the Kingdom, but fully provided for the happy Progress of the Parliament; and therefore We cannot but wonder, since such Power hath been always left here by Commission for the Government of this Kingdom when Our Progenitors have been out of the same during the Sitting of Parliaments: And since yourselves desired that such a Power might be left here by Us at Our last going into Scotland, what Law of the Land have you now found to dispense with you from submitting to such Authority legally derived from Us in Our Absence, and to enable you to govern this Kingdom by your own meer Authority? "For Our Return towards London, We have given you so full an Answer in Our late Declaration, and in Answer to your Petition presented to Us at Yorke the 26th of March last, that We know not what to add, if you will not provide for Our Security with you, nor agree to remove to another Place, where there may not be the same Danger to Us. 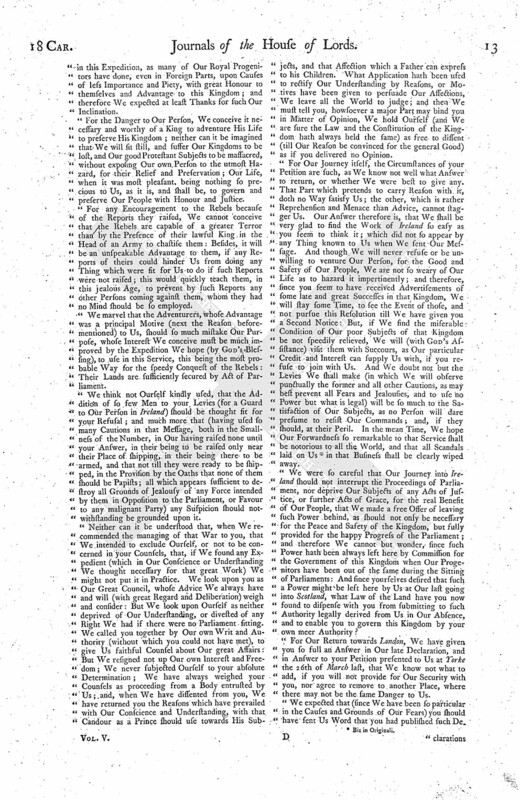 "We expected that (since We have been so particular in the Causes and Grounds of Our Fears) you should have sent Us Word that you had published such De clarations against future Tumults and unlawful Assemblies, and taken such Courses for the suppressing of seditious Sermons and Pamphlets, that Our Fears of that Kind may be laid aside, before you should press Our Return. "To conclude, We could wish that you would (with the same Strictness and Severity) weigh and examine your Messages and Expressions to Us, as you do those you receive from Us; for We are very confident, that, if you examine Our Rights and Privileges by what Our Predecessors have enjoyed, and your own Addresses by the usual Courses of your Ancestors, ye will find many Expressions in this Petition warranted only by your own Authority, which indeed We forbear to take Notice of, or give Answer to, lest We should be tempted (in a just Indignation) to express a greater Passion than We are yet willing to put on. God in His good Time (We hope) will so inform the Hearts of all Our Subjects, that We shall recover from the Mischief and Danger of this Distemper, on whose good Pleasure We will wait with all Patience and Humility." The King's Second Message was read next: videlicet, "His Majesty, having seen a printed Paper, intituled, A Question answered, how Laws are to be understood, and Obedience yielded (which Paper he sends together with this Message), thinks fit to recommend the Consideration of it to His House of Peers, that they may use all possible Care and Diligence for the finding out the Author, and may give Direction to His Learned Counsel to proceed against him, and the Publishers of it, in such a Way as shall be agreeable to Law and the Course of Justice, as Persons who endeavour to stir up Sedition against His Majesty; and His Majesty doubts not but that they will be very sensible how much their own particular Interest (as well as the public Government of the Kingdom) is and must be shaken, if such Licence shall be permitted to bold factious Spirits to withdraw His Majesty's Subjects strict Obedience from the Laws established, by such seditious and treasonable Distinctions: And of Doctrines of this Nature His Majesty doubts not but that their Lordships will publish their great Dislike, it being grown into frequent Discourse, and vented in some Pulpits (by those desperate turbulent Preachers, who are the great Promoters of the Distempers of this Time), that human Laws do not bind the Conscience; which being once believed, the Civil Government and Peace of the Kingdom will be quickly dissolved. His Majesty expects a speedy Account of their Lordships exemplary Justice upon the Authors and Publishers of this Paper." Ordered, That this First Message of the King's shall be communicated by Message to the House of Commons; and accordingly it was sent down to the House of Commons, by Sir Edward Leech and Mr. Page. 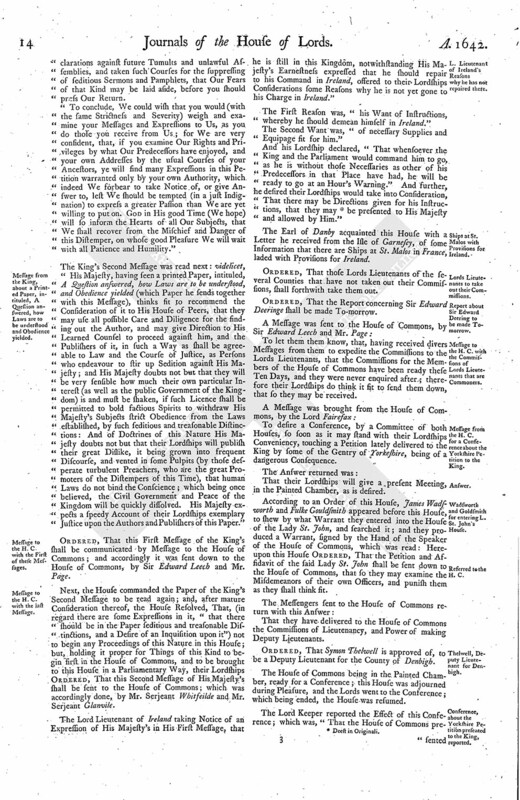 Next, the House commanded the Paper of the King's Second Message to be read again; and, after mature Consideration thereof, the House Resolved, That, (in regard there are some Expressions in it, "that there should be in the Paper seditious and treasonable Distinctions, and a Desire of an Inquisition upon it") not to begin any Proceedings of this Nature in this House; but, holding it proper for Things of this Kind to begin first in the House of Commons, and to be brought to this House in a Parliamentary Way, their Lordships Ordered, That this Second Message of His Majesty's shall be sent to the House of Commons; which was accordingly done, by Mr. Serjeant Whitfeilde and Mr. Serjeant Glanvile. The Lord Lieutenant of Ireland taking Notice of an Expression of His Majesty's in His First Message, that he is still in this Kingdom, notwithstanding His Majesty's Earnestness expressed that he should repair to his Command in Ireland, offered to their Lordships Considerations some Reasons why he is not yet gone to his Charge in Ireland." The First Reason was, "his Want of Instructions, whereby he should demean himself in Ireland." The Second Want was, "of necessary Supplies and Equipage fit for him." And his Lordship declared, "That whensoever the King and the Parliament would command him to go, as he is without those Necessaries as other of his Predecessors in that Place have had, he will be ready to go at an Hour's Warning." And further, he desired their Lordships would take into Consideration, "That there may be Directions given for his Instructions, that they may (fn. 2) be presented to His Majesty and allowed by Him." The Earl of Danby acquainted this House with a Letter he received from the Isle of Garnesey, of some Information that there are Ships at St. Malos in France, laded with Provisions for Ireland. Ordered, That those Lords Lieutenants of the several Counties that have not taken out their Commissions, shall forthwith take them out. Ordered, That the Report concerning Sir Edward Deeringe shall be made To-morrow. To let them them know, that, having received divers Messages from them to expedite the Commissions to the Lords Lieutenants, that the Commissions for the Members of the House of Commons have been ready these Ten Days, and they were never enquired after; therefore their Lordships do think it fit to send them down, that so they may be received. To desire a Conference, by a Committee of both Houses, so soon as it may stand with their Lordships Conveniency, touching a Petition lately delivered to the King by some of the Gentry of Yorkeshire, being of a dangerous Consequence. That their Lordships will give a present Meeting, in the Painted Chamber, as is desired. According to an Order of this House, James Wadsworth and Fulke Gouldsmith appeared before this House, to shew by what Warrant they entered into the House of the Lady St. John, and searched it; and they produced a Warrant, signed by the Hand of the Speaker of the House of Commons, which was read: Hereupon this House Ordered, That the Petition and Affidavit of the said Lady St. John shall be sent down to the House of Commons, that so they may examine the Misdemeanors of their own Officers, and punish them as they shall think fit. That they have delivered to the House of Commons the Commissions of Lieutenancy, and Power of making Deputy Lieutenants. Ordered, That Symon Thelwell is approved of, to be a Deputy Lieutenant for the County of Denbigh. The House of Commons being in the Painted Chamber, ready for a Conference; this House was adjourned during Pleasure, and the Lords went to the Conference; which being ended, the House was resumed. The Lord Keeper reported the Effect of this Conference; which was, "That the House of Commons pre sented to their Consideration a Copy of a Petition which was presented to the King at Yorke, from divers of the Gentry of the County of Yorke." "The humble Petition of the Gentry and Commons of the County of Yorke. "Encouraged by Your [ (fn. 3) Majesty's many Testimonies of Your] gracious Goodness to us and our County, which we can never sufficiently acknowledge, do in all Duty and Loyalty of Heart humbly address ourselves to Your Sacred Majesty, beseeching You to cast Your Eyes and Thoughts upon the Safety of Your own Person, Your Princely Issue, and this whole County, a great Means of which, we conceive, doth consist in the Arms and Ammunition at Hull, placed there by Your Princely Care and Charge, which by Your Majesty was conceived necessary for the Defence of the Northern Parts of this Kingdom, and since, upon Apprehension of Dangers from Foreign Parts represented to Your Majesty, thought fit as yet to be continued: We, for our Parts, conceiving ourselves to be still in Danger, humbly beseech Your Majesty, that You would be pleased to take such Course and Order, that Your Magazine of Ammunition may still there remain, for the better securing of these and the rest of the Northern Parts; and the rather, because we think it most fit, that that Part of the Kingdom should be best provided where Your Sacred Person doth reside; Your Person being the David, the Light of Israell, and worth more than Ten Thousands of us; who shall daily pray, etc." Sir Paul Neale. Mr. Bryan Palmes. And Eight or Ten more, whose Names are not known. "1. The Preface is false styled, A Petition of the Gentry and Commons, being delivered only by a few. "2. That it is wholly grounded upon a Presumption that the King and Prince will reside there, which is directly contrary to the continual Desires of both Houses of Parliament. "3. 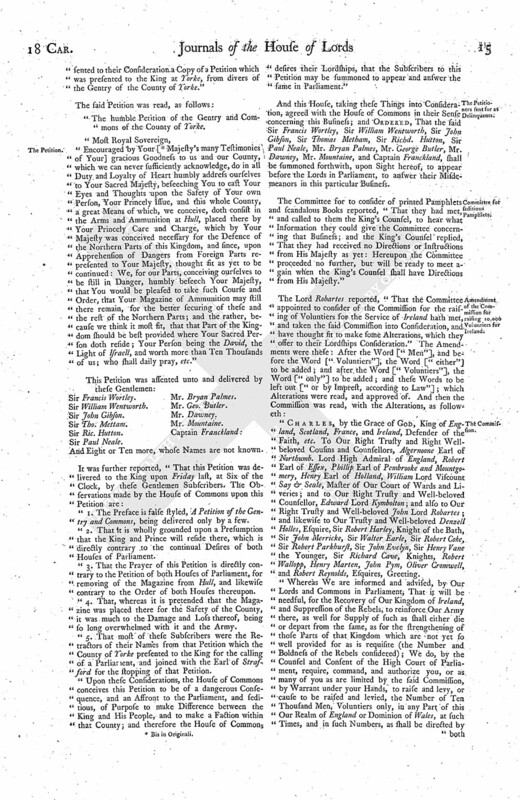 That the Prayer of this Petition is directly contrary to the Petition of both Houses of Parliament, for removing of the Magazine from Hull, and likewise contrary to the Order of both Houses thereupon. "4. That, whereas it is pretended that the Magazine was placed there for the Safety of the County, it was much to the Damage and Loss thereof, being so long overwhelmed with it and the Army. "5. That most of these Subscribers were the Retractors of their Names from that Petition which the County of Yorke presented to the King for the calling of a Parliament, and joined with the Earl of Strafford for the stopping of that Petition. 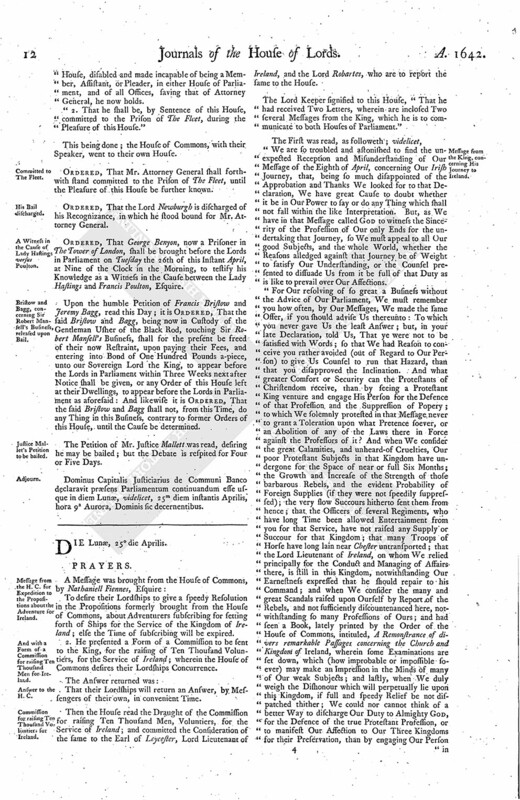 "Upon these Considerations, the House of Commons conceives this Petition to be of a dangerous Consequence, and an Affront to the Parliament, and seditious, of Purpose to make Difference between the King and His People, and to make a Faction within that County; and therefore the House of Commons desires their Lordships, that the Subscribers to this Petition may be summoned to appear and answer the same in Parliament." And this House, taking these Things into Consideration, agreed with the House of Commons in their Sense concerning this Business; and Ordered, That the said Sir Francis Wortley, Sir William Wentworth, Sir John Gibson, Sir Thomas Metham, Sir Richd. Hutton, Sir Paul Neale, Mr. Bryan Palmes, Mr. George Butler, Mr. Dawney, Mr. Mountaine, and Captain Franckland, shall be summoned forthwith, upon Sight hereof, to appear before the Lords in Parliament, to answer their Misdemeanors in this particular Business. The Committee for to consider of printed Pamphlets and scandalous Books reported, "That they had met, and called to them the King's Counsel, to hear what Information they could give the Committee concerning that Business; and the King's Counsel replied, That they had received no Directions or Instructions from His Majesty as yet: Hereupon the Committee proceeded no further, but will be ready to meet again when the King's Counsel shall have Directions from His Majesty." "Charles, by the Grace of God, King of England, Scotland, France, and Ireland, Defender of the Faith, etc. To Our Right Trusty and Right Wellbeloved Cousins and Counsellors, Algernoone Earl of Northumb. Lord High Admiral of England, Robert Earl of Essex, Phillip Earl of Pembrooke and Mountgomery, Henry Earl of Holland, William Lord Viscount Say & Seale, Master of Our Court of Wards and Liveries; and to Our Right Trusty and Well-beloved Counsellor, Edward Lord Kymbolton; and also to Our Right Trusty and Well-beloved John Lord Robartes; and likewise to Our Trusty and Well-beloved Denzell Holles, Esquire, Sir Robert Harley, Knight of the Bath, Sir John Merricke, Sir Walter Earle, Sir Robert Coke, Sir Robert Parkhurst, Sir John Evelyn, Sir Henry Vane the Younger, Sir Richard Cave, Knights, Robert Wallopp, Henry Marten, John Pym, Oliver Cromwell, and Robert Reynolds, Esquires, Greeting. "Whereas We are informed and advised, by Our Lords and Commons in Parliament, That it will be needful, for the Recovery of Our Kingdom of Ireland, and Suppression of the Rebels, to reinforce Our Army there, as well for Supply of such as shall either die or depart from the same, as for the strengthening of those Parts of that Kingdom which are not yet so well provided for as is requisite (the Number and Boldness of the Rebels considered); We do, by the Counsel and Consent of the High Court of Parliament, require, command, and authorize you, or as many of you as are limited by the said Commission, by Warrant under your Hands, to raise and levy, or cause to be raised and levied, the Number of Ten Thousand Men, Voluntiers only, in any Part of this Our Realm of England or Dominion of Wales, at such Times, and in such Numbers, as shall be directed by both Houses of Parliament, not exceeding Ten Thousand Men in the whole, as in your Judgements shall appear to be best for Our Service, and for the more speedy reducing that Kingdom into Our Obedience: And Our Will and Pleasure is, That this shall be added as One of the Instructions, to be put in Execution in such Manner, and by such Number of you, as the other Instructions annexed to that Commission are to be, by virtue of Our Commission under Our Great Seal, bearing Date at Westm. the Fourth Day of this Instant April, to you made, by Advice of Our High Court of Parliament; and this, together with the said Commission, shall be your sufficient Warrant for the Execution thereof, as of any other Article or Clause contained in Our Instructions already annexed to Our said Commission. Given, etc." This being read; this House Ordered, That the Committee mentioned in this Commission shall have Power to draw up and prepare the Form of a Commission, to be given from the King, to the Justices of the Peace, in the several Counties of England, to impress, by the Consent of both Houses of Parliament, according to the Act of Parliament, so many Soldiers as shall be wanting to make up the full Number of Ten Thousand Men. Ordered, That the Lords Committees for to consider of the Propositions of the Adventurers for setting forth Ships for the Service of Ireland shall meet this Afternoon, at Three of the Clock, and peruse the said Propositions, and report their Opinions of the same to this House To-morrow Morning. Ordered, That the Earl of Berks, the Lord Wharton, the Lord Pagett, and the Lord Capell, shall be added to the Committee for the Propositions of the Sea Adventurers for Ireland. Ordered, That it is referred to the Consideration of the Committee for the Irish Affairs, to expedite the Lord Lieutenant's Journey into Ireland, and to consider what Instructions and Accommodations are fit for his Lordship to have. Ordered, That the Lord Viscount Loftus his Cause shall be heard To-morrow Morning at this Bar; at which Time Counsel and Witnesses on both Sides are to attend. Ordered, That the Committee concerning Mr. Allen's Business shall meet this Afternoon, at Four of the Clock, in the Painted Chamber. Upon the humble Suit of Mr. John Clarke, the now Curate of Stisted, in the County of Essex, made to this House this Day; it is Ordered, That the (fn. 4) said Mr. John Clarke is hereby specially recommended to the Archbishop of Canterbury to be Minister and Parson of the Church of Stisteed aforesaid, according to a former Order of this House, dated the 20th of this Instant April; the said Mr. Clarke being (as hath been affirmed by the Parishioners there and divers Ministers) a Man of sound Doctrine and good Life. Dominus Custos Magni Sigilli declaravit præsens Parliamentum continuandum esse usque in diem Martis, videlicet, 26m diem instantis Aprilis, hora 9a Aurora, Dominis sic decernentibus.